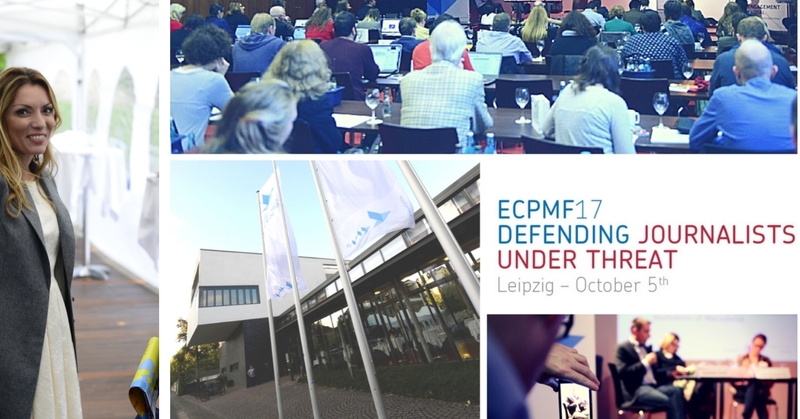 The contemporary threats to journalists extend to all reaches in media, and in some cases, threaten media freedom – reports Netopia from the ECPMF conference “Defending Journalists Under Threat” in Leipzig. Held at the Leipzig School of Media, set in the grounds of the European Centre for Press and Media Freedom, a modern building full of clean lines, full-length windows and wood panelling is not the sort of place one would associate with the accounts of being threatened by ISIS or watching migrants struggle for life, but that’s what conference attendees were about to hear. So, following a keynote speech by Harlem Désir the OSCE Representative on Freedom of the Media, delegates – NGOs, Journalists and media freedom advocates – heard how an environment of citizen journalism, bloggers and freelance workers sees the psychological pressures of reporting from areas of refugee crisis, in war zones underrepresented as a threat. The danger is also increased, the conference heard, when set against cuts in media funding. Vocal proponent of strengthening hate speech law is Swedish Journalist and TV host, Alexandra Pascalidou: “If free speech is oxygen of democracy, let’s make sure they can breathe”. The conference fell silent during her powerful video documenting the threats she’s faced. Public Interest in whistleblowing was outlined by Georgia Georgiadou, Deputy Head of the Unit “Fundamental Rights policies” in DG JUSTICE, European Commission who talked through the EC’s plans to add legal level protection. The discussion moved to Flutura Kusari who then presented the work being done by the ECHR Standards of Protection of Whistleblowers. While Whistleblowers are widely understood, public interest has a narrow definition. In the afternoon session Prof. Katharine Sarikakis gave a presentation entitled: “The Assault on Journalism – building knowledge to protect freedom of expression”. How is the monitoring and recording of journalists reported? The data available covers the countries who provide reliable statistics, but have a severely under-reported element, like lack of data on age, gender, job title and even those who may have committed suicide. The numbers are viewed as authoritative, but a minimum total. Dr Karen Fowler-Watt covered the varied contexts where journalists are exposed to experiences which can leave them suffering trauma – even without leaving the newsroom. She notes the dearth of unedited raw footage which journalists view online from the comfort of their office, be that war footage, terror events, humanitarian catastrophes. Dr Fowler-Watt also talked about the project DART which is looking at ways in which to support the those suffering the effects of eye-witness reporting. Marianne Hovdan, a protection manager at the International Cities of Refugee Network (ICORN) followed up and told the conference how journalists may have spent years in jail and come to their programme either fully traumatized or displaying a semblance of normality, which, when their adrenaline of war drops often manifested the effects of the persecution they had suffered. ProtectDefenders.eu – are an EU temp relocation platform. Grants co-ordinator Tommaso Mignani outlined their offer of fellowship, scholarships, grants and that a big part of the programme is dedicated to human rights’ defenders – journalists the focus – with small emergency grants to individuals at risk. These grants can cover legal, medical, relocation, family support, humanitarian support. Grants for organisation, NGOs may also be supported. Finally, temporary location grants, and the secretariat in Brussels. We partner in cases of relocation. The sort of practical solutions discussed ranged from setting up websites to organising radio programmes for journalists under threat to continue their work with impunity from persecution. Similarly, the day to day practical needs of housing, language courses, and emotional support (counselling, therapy) were needed, according to ICORN-ORG. ICORN’s Marianne Hovdan also noted a spirit of great co-operation among peer organisations: “Working in Europe, given the visa restrictions, we should approach the practical solution of defending journalists under threat somewhat creatively. “In fact, I’ve never contacted an organisation working with Human Rights where I’ve asked for help, and sharing of information and been met with a “no”. President of the Association of Journalists of Macedonia, Naser Selmani gave a damming account of regressive media freedom and plurality [see video]. He posseted a scenario where Eastern Europe was of secondary importance to the EU and large swathes of it (including Macedonia) served as a buffer zone, as exemplified by the conditions of media freedom in the country. Urska Umek from the Council of Europe spoke about alarm systems, she said: “We have a problem monitoring the standards set by the council of Europe and must rely on external sources for verifying the safety of journalists, media freedom in individual states”. She also suggested some sort of league table on the Council of Europe’s website, but says she her department hopes for more enforceable measures and that member states to collaborate with one another to further media plurality in Europe. There exists a gap between the high-standards of delegates, and laws of some countries (Germany has no whistleblower law, but Serbia has). And there was concern for the many journalists in prisons. Problems associated with protecting the integrity of journalism were not created overnight, and will likewise not be solved overnight. The network of organisations at the ECPMF event showed they are awake to an ever-changing landscape of threats to media freedom and plurality, and they seek to counter.